RENO, Nev. -- Hundreds of homes were evacuated in northern Nevada and stranded motorists were pulled from cars stuck on flooded Northern California roads as thunderstorms arrived as part of a massive winter storm that could be the biggest to slam the region in more than a decade. Crews in California cleared trees and debris Sunday following mudslides caused by steady rain accompanying the system that could dump 15 inches in the foothills of the Sierra and heavy snow on mountaintops before, it’s expected, moving east Monday. Forecasters warned a second storm is expected to hit the already drenched area Monday night. CBS San Francisco reports the storms arrive as California entered its sixth year of drought. Each drop of rain is welcomed but officials said several more big storms are needed to replenish depleted groundwater supplies. In Nevada, emergency officials voluntarily evacuated a total of 400 homes in a south Reno neighborhood Sunday afternoon as the Truckee River began to leave its banks and drainage ditches started to overflow south of U.S. Interstate 80. No injuries had been reported, but high waters forced the closure of numerous area roads, a series of bridges in downtown Reno and a pair of Interstate 80 off-ramps in neighboring Sparks, where the worst flooding is expected to send several feet of water early Monday into an industrial area where 25,000 people work. The California Highway Patrol said late Sunday that I-80 had been closed “in both directions between Truckee and Donner Summit. Westbound is closed due to a massive mud/snow slide. Eastbound is closed in the same area due to power lines down across the road,” the CHP said. Bob Elsen of Sparks said he saw plenty of wet weather in his former hometown of Bremerton, Washington, but he didn’t expect it in Nevada’s high desert, where only 8 inches of precipitation falls annually on average. An avalanche also closed a portion of the Mount Rose Highway connecting Reno to Lake Tahoe for the second time in three days after more than 6 feet of snow fell atop the Sierra last week. Schools were ordered closed Monday throughout the Reno-Sparks area. Gov. Brian Sandoval - who declared a state of emergency on Saturday - told all non-essential state employees to stay home Monday. “All first responders are all hands on deck,” Washoe County Emergency Manager Aaron Kenneston told reporters at a briefing in Reno Sunday afternoon. The storm surge stretching all the way from Hawaii - called an atmospheric river - comes as California enters its sixth year of drought. Each drop of rain is welcomed, but officials said several more big storms are needed to replenish depleted groundwater supplies. In Northern California, toppled trees on Sunday crashed against cars and homes or blocked roads in the San Francisco Bay area, and officials rescued stranded motorists from cars stuck on flooded roads Sunday. A giant tree fell across the southbound lanes of Interstate 230 in Hillsborough, injuring one driver who couldn’t brake in time and drove into the tree. A woman was killed Saturday by a falling tree while she took a walk on a San Francisco Bay Area golf course. And divers pulled an unconscious driver from a cab that careened off a road near the Oakland International Airport Sunday and became submerged in the Oakland Estuary, and he later died, reports CBS San Fransicso. 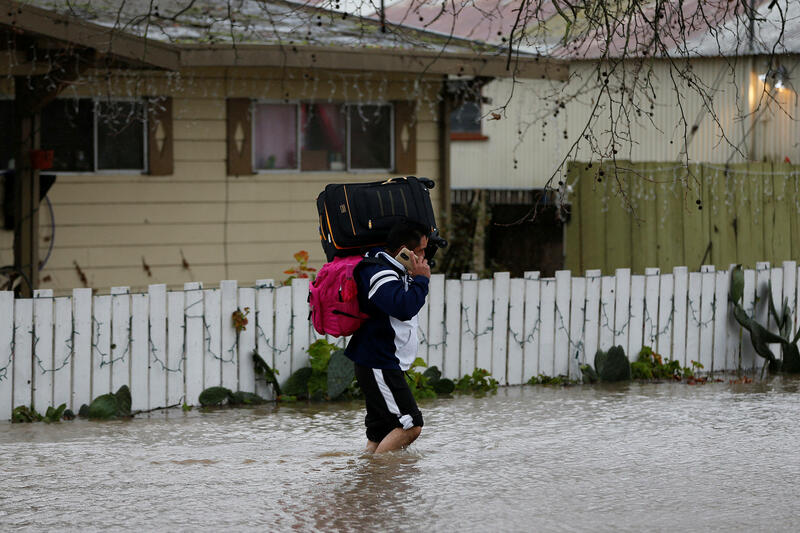 There were mudslides and flooding throughout Northern California that led to road closures, especially in the North Bay, one of the areas hardest hit and where the Napa River jumped its banks. Farther north, the U.S. 395 highway was temporarily closed in both directions in Mono County because of flooding. Authorities were watching rising water levels of several rivers, including the Cosumnes, Truckee, Merced, American and Russian. All roads leading to Yosemite National Park’s valley floor remained closed amid fears that the Merced River could overflow its banks and cause major flooding. “It’s kind of surreal how empty the park is. There’s nobody here,” said Gary Kazanjian, a freelance photographer who spent the night in Yosemite and drove out Sunday as part of a caravan of stragglers. At the Santa Cruz Diner in downtown Santa Cruz, customers kept the crew relatively busy. Manager Garin Peck said the restaurant was quiet Saturday but Sunday was a typical day for the diner near the San Lorenzo River. Relatively mild temperatures were driving up the snowline to above 9,000 feet throughout the Sierra Nevada, causing runoff in the lower elevations, where the ground is already saturated. Forecasters said Sunday it was tracking pretty much as they expected.